"Kapag Eyeball, para sa mga chatmates at textmates agad, hindi ba pwedeng sa mga Bloggers rin muna." This is a famous Joke format popularized by Vice Ganda in the Blockbuster movie Praybet Benjamin. And I think, this line fits the 2nd Year of the GandaEversoMuch Blogfest SOCCSKSARGEN. Yes, you heard it right! Following the huge success of the First Blogfest SOCCSKSARGEN last December 11, 2011 held at East Asia Royale Hotel (with over 120 participants), comes another version of this Grand Eyeball of Bloggers in Mindanao. 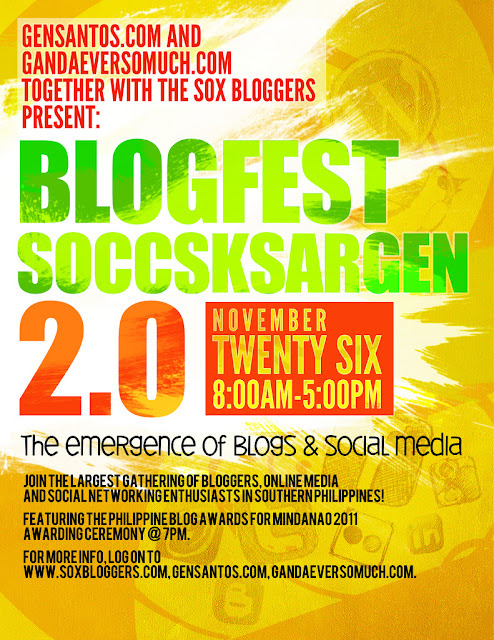 The Blogfest SOCCSKSARGEN 2.0. This years' Eyeball and Convention of talented Bloggers was duly organized by GANDAEVERSOMUCH (Mr. Ormal Manansala), GENSANTOS.COM (Mr. Avel Manansala, Bariles, Founder of SOX Bloggers) and the every energetic and funnest SOX Bloggers. Thanks to Bariles himself (Mr. Avel Manansala) for making this event an annual affair for all bloggers in the Mindanao to meet in one venue of skills development and enhancement. Thus, creating a more intimate relationship with fellow bloggers and be able to share knowledge and tips with each other to become better in the World of Blogging. And the poster below (Courtesy of www.gensantos.com) is just a teaser of the star-studded Guest speakers that will be gracing the event. 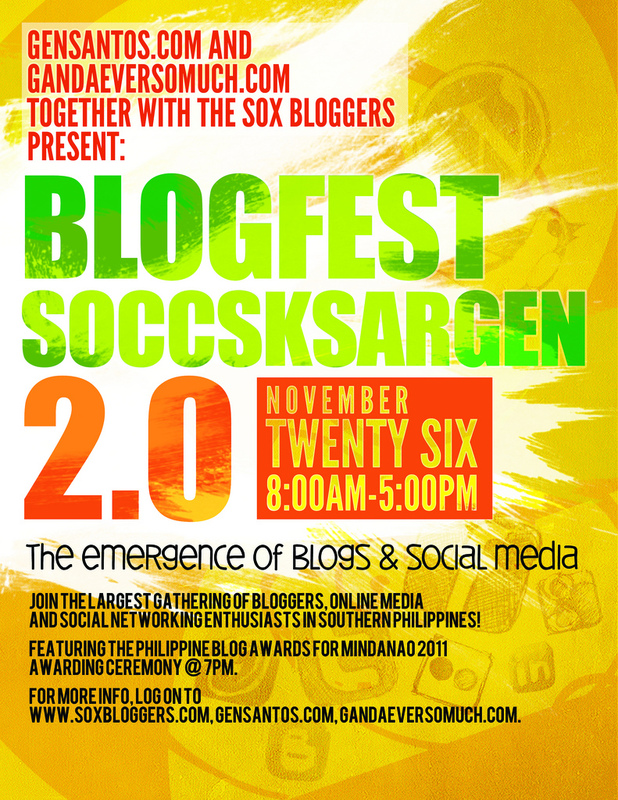 The Blogfest SOCCSKSARGEN 2.0 has a theme, "The Emergence of Blogs and Social Media". The theme is just perfect for today's trend wherein Social Media is really creating a great impact to our society. Thus, with the help of the respected pool of Guest Speakers and VIP's above, I'm pretty sure that the bloggers will surely learn great insights out of this meaningful event and gathering. Not only SOX Bloggers are encouraged to attend, but also all students and individuals who wanted to enhance their Blogging Skills and be well-acquainted with the Emergence of Social Media nowadays. How I wish I could attend this great event but unfortunately, I have a duty on the said date. But being able to blog about it and let others know about this momentous gathering of Bloggers, is already a great pleasure for me. What more can I say! Kudos to the Organizers especially to Bariles! 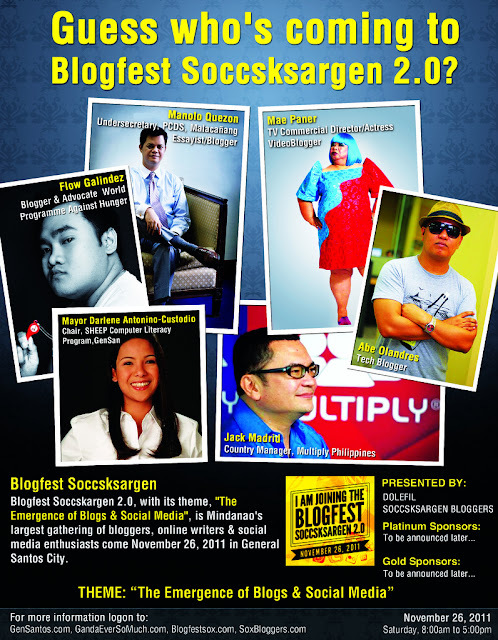 Way to go SOCCSKSARGEN Bloggers and all the Bloggers here in Mindanao! Mabuhay tayong lahat! Magandang GenSan everyone!